Asheville NC has been known for its many fine builders of luxury timber homes for many years now. 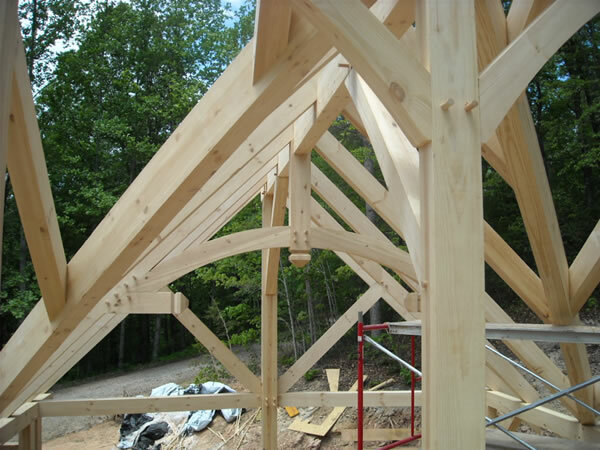 The Asheville area is gorgeous and home buyers seeking luxury timber frame homes will not be dissappointed. Call Green Mountain Realty today at 828.215.9064 for luxury homes, timber frame homes, land or real estate in the Asheville area. View of Whiteside Mountain's cliffs, Timber Ridge's rock face and many more mountains are clearly visible from the upper and lower decks and from many of the interior rooms of this 1999 vintage lodge-style mountain estate. The property adjoins the U.S. National Forest Service land. There are 3 generous-sized bedroom suites on the main living level, 1 more upstairs with a den/office, while downstairs offers an entire additional living area with a billiard room, fireplace and bedroom suite. Some of the other attributes of note include 3 stone fireplaces, cathedral ceilings in many rooms, outdoor built-in cook grill, circular driveway with stone columned porte cochere, hot tub and great garden space on 2.5 acres. There are two covered decks on the main and upper levels that provide space for enjoying the distant views. I have a question about the property at 95 Cliffmont Road Cashiers NC 28717 (#3437742). I would like to schedule a visit for the property at 95 Cliffmont Road Cashiers NC 28717 (#3437742). Fabulous Al Platt designed home on Toxaway Mountain in Lake Toxaway Estates. Sweeping views of Lake Toxaway and 7 mountain ranges with an additional building site for a second home. Features include shake roof, slate and wood floors, granite surfaces, massive stone fireplace in Great Room, extensive beam work, steam room, Endless Pool, theatre facility, cedar lined closet, and heated two-car garage. A covered, screened porch with outdoor wet bar and fireplace make this home an exceptional mountain estate. I have a question about the property at 1035 Toxaway Drive Lake Toxaway NC 28747 (#3238977). I would like to schedule a visit for the property at 1035 Toxaway Drive Lake Toxaway NC 28747 (#3238977). Skyfall - This stunning post & beam home is in High Cliffs at Round Mountain, just south of the charming town of Black Mountain. Panoramic mountain views, sunrises, sunsets from everywhere - floor to ceiling windows, full length main level Trex deck, partially covered. 2-story great room boasts soaring fireplace highlighted by inlaid deer mural. European influenced kitchen w/granite, Wolf gas stove, double oven, Subzero fridge. Main level master offers stone tile FP, wood rafter ceilings, views from private deck, en-suite bath w/Jacuzzi tub, slate tile floors. Graceful maple wood staircase to loft overlooking great room. Lower level entertainment room w/granite wet bar, wine nook, beautiful FP, wiring for surround sound, & opens onto stone terrace. Two beautiful guest suites with king beds, en-suite baths. Plenty of room for outside entertaining as well, level, landscaped yard. Fully furnished. Laundry on both levels. 3br, 3ba, 3 half ba 4133 SF high-speed broadband wireless internet. I have a question about the property at 138 High Cliffs Trail Black Mountain NC 28711 (#3475799). I would like to schedule a visit for the property at 138 High Cliffs Trail Black Mountain NC 28711 (#3475799).